The US childhood immunization schedule specifies 26 vaccine doses for infants aged less than 1 year — the most in the world — yet 33 nations have lower IMRs. Using linear regression, the immunization schedules of these 34 nations were examined and a correlation ... was found between IMRs and the number of vaccine doses routinely given to infants ... 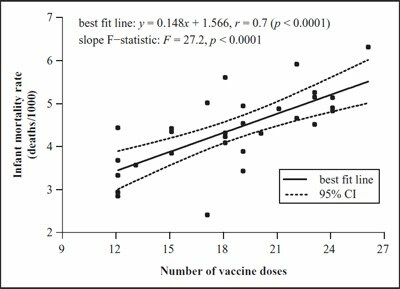 Linear regression analysis of unweighted mean IMRs showed a high statistically significant correlation between increasing number of vaccine doses and increasing infant mortality rate ... A closer inspection of correlations between vaccine doses, biochemical or synergistic toxicity, and IMRs is essential.